State Soils: Do You Dig It? The state officer team had the opportunity to assist with the State Soils Career Development Event yesterday in Martinsville. As a four year soils judge myself, I was extremely excited to travel to the state contest and to see it from a different perspective. My teammates and I got to see members and friends from across the state as we spent the day registering enthusiastic teams that had been practicing for months and helping to tabulate scores. After our day of checking Scantron sheets for computer errors, we were given the opportunity to recognize those teams and individuals who had posted outstanding scores. The top five teams in the 4-H and FFA divisions qualified for the national competition in Oklahoma City next May. The first place 4-H team was the Jay County team, and the top FFA team and the highest scoring team overall was the team representing the Southmont FFA chapter. Full results should be available on the Purdue CDE website within the next two days. We congratulate all who participated, as even though not everyone came away with a trophy or a plaque, everyone was given the opportunity to make new friends, learn new skills, and have a great time in Martinsville this weekend! The 84th National FFA Convention has come and gone; too quickly I might add. I think I can speak for us all when I say that convention has definitely been one of the newest highlights of our year. Having the opportunity to be surrounded by and meet so many amazing new people is such a blessing. From arriving at the Westin Hotel on Monday October 17, to our departure this past Sunday, I can honestly say that there was never a dull moment! The most excitement on Monday came from the reuniting of friends, and making new ones! The Indiana FFA State Officers were privileged to attend The National Leadership Conference for State Officers (NLCSO) in Georgia this year, rather than the traditional Illinois location. At NLCSO we made friends with the Associations from Florida, North Carolina, Georgia, and South Carolina. Being able to see the members of these teams again was awesome! It is truly an amazing experience to be able to meet and befriend such a diverse, unique group of individuals! Not only were we reunited with our southern friends, my teammates and I were excited to see our good friends from the Illinois FFA Association as well, whom we met and worked with at the Farm Progress Show. Seeing our friends again was just one of the many exciting parts of National Convention! Tuesday morning began the official start of the delegate process with delegate training, followed by our first committee meetings! This year, there were 6 committees created to address certain proposals. The committee meetings, to me, were very enjoyable. It was an awesome experience to use our parliamentary procedure experience to discuss and pass various motions and proposals to create the best form of a committee recommendation to present to The National FFA Organization. Another exciting, amazing aspect of the delegate process and committee hearings, was the fact that there was only ONE adult in each room of 50 plus students. The adults were simply there as super vision, or mediators, if needed. Their position allowed for the entire committee hearing to be ran by the committee chairs and members alone. Allowing a room of 50 to 80 students to discuss and debate topics to recommend to The National FFA to consider was an eye-opening experience for me! To see all of these students between the ages of 16 and 20 making informed decisions and recommendations with such professionalism was awesome and to be a part of that; even better. I was honored to be among FFA's finest doing what America's largest youth led organization does best; MAKE A DIFFERENCE. The excitement continued throughout the official business sessions. As we broke out of our committees, we gathered as one large delegation body to discuss and vote. Once again, seeing and experiencing the amount of knowledge, passion, and determination from my peers being focused toward passing proposals was incredible. Once the business side was completed, it was time for some fun! Once the delegates were finally able to attend the 1st general session, we were all pumped! The team was lucky to have been in the photo/video shoot for the convention song, and seeing ourselves singing and dancing on screen was so cool! The National Officers did an amazing job presenting the sessions as well as their retiring addresses! The high energy sessions made convention even more exciting! 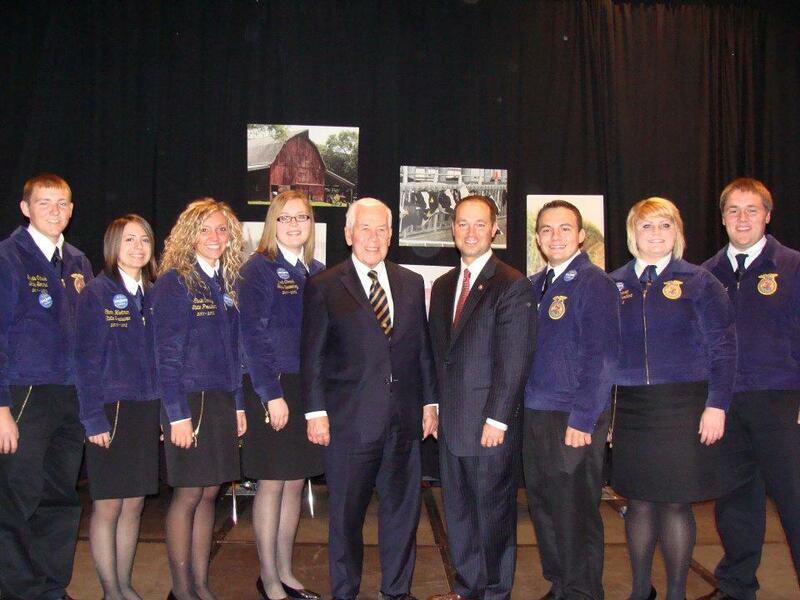 As a state officer team were privileged to meet with Senator Mike Pence as well as Congressman Marlin Stutzman and Senator Richard Lugar during convention. Mr. Pence shared comments with us about convention, and entertained questions from myself and the team during a brief meet and greet. Also, we were able to meet with Congressman Stutzman and Senator Lugar to discuss the Farm Bill commonly known as REFRESH. Both experiences were very unique as well as exciting. 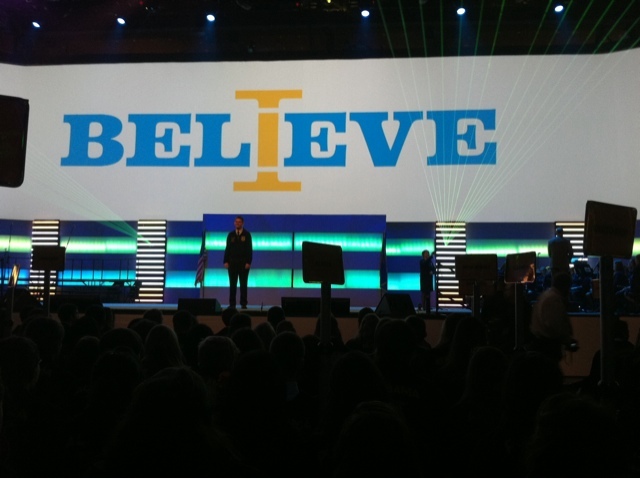 Indiana had an extremely exciting and memorable week at the 84th National FFA Convention! On Tuesday night, we were very pleased to hear that our National Officer Candidate, Morgan Gadd, had made the cut to the final 20 National Officer Candidates. Although Gadd was not elected, we are extremely proud of her, and know that because she is an amazing and intelligent individual, there are many opportunities in store for her. Also, as the week wound down, we were excited to find that Indiana's very own Eastern Hancock had won the National Livestock Judging Competition, and that North Miami placed second in Dairy Cattle Evaluation! The team and I are now looking forward to and planning for out Seeking Opportunities Achieving Results (S.O.A.R) Conference. Convention Was definitely an absolute blast. I am currently missing all of the friends that I was able to see again, as well as the new friends that I gained! 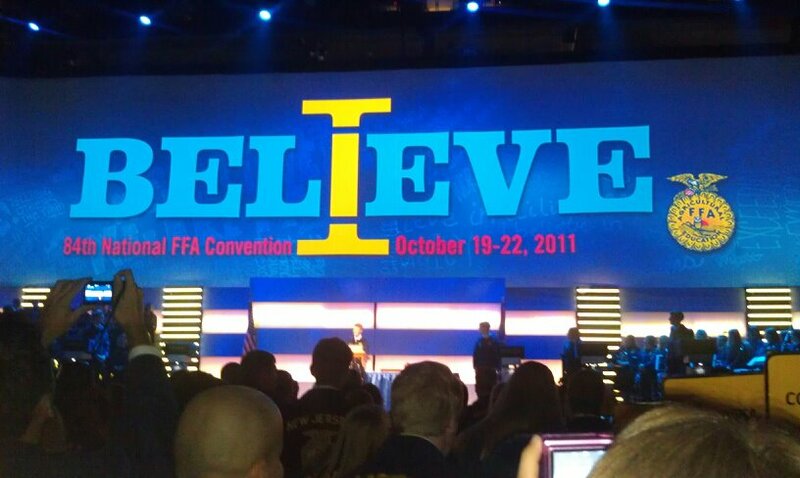 Unfortunately, convention is over, but the memories and achievements will be with Indiana FFA forvever. REFRESHing News Fresh from D.C. This morning FFA members from across Indiana were given a very unique opportunity: the opportunity to meet with not one, but two members of congress to discuss the REFRESH (Rural Economic Farm and Ranch Sustainability Act) Act. I was very excited to see the seats in the room nearly full of blue jackets by the time that Ted McKinney took the stage to introduce Congressman Marlin Stutzman and Senator Richard Lugar. 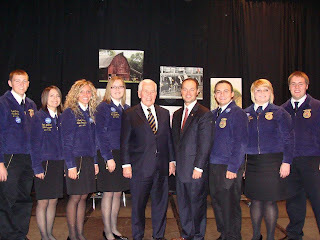 Both Congressman Stutzman and Senator Lugar have agriculture in their backgrounds and serve on the agriculture committees in their respective legislative bodies. After brief introductions of themselves and the act, members were allowed and encouraged to ask questions. The two legislators answered our questions and gave us great insight on the direction of the act. Then everyone in a blue jacket in the crowd had the chance to meet the two before we parted ways. The REFRESH Act listening session was a great opportunity for Indiana FFA members to meet the people representing them in Washington, and we definitely need to send a shout-out to past state officer Rachel Demaree for making it happen! Thanks Rachel! To say that I was excited for the Seventh General Session of the National FFA Convention would be an understatement. Just look at what was on the schedule; all of the speaking CDE award results as well as the retiring address of my favorite national officer, Western Region Vice President Shannon Norris. So, I guess that it could be said that I was lucky to witness so many sensational happenings in the same session. But as much as I was prepared for some exciting results as well as an incredible speech from an incredible person, I was totally unprepared for the keynote speaker, Mr. David Garibaldi. As the stage attendants rushed to assemble the backdrop for Galibardi's presentation, the audience stared in awe, wondering why a speaker would need an easel, lots of plastic drop cloths, a DJ, and finally a large white screen that seemed to be splattered with paint. As the DJ finished his set-up, an emcee attempted to pump up the crowd in the arena. He explained with a boisterous voice that Mr. Garibaldi was an artist who painted six-foot-tall portraits of celebrities in just a few minutes. He also mentioned that Garibaldi had raised over $750,000 for charities. I was confused, pumped, and stunned in anticipation. When Garibaldi took the stage it seemed as if it was the 90's and the Bulls were playing for the NBA Championship, as the lights were low and the noise was loud. And what about Garibaldi's appearance? He was wearing a black shirt and blue jeans covered in paint, with 6 small neon yellow stripes across his chest. He looked wild and crazy. The entire crowd realized that whatever was about to happen would be epic. Garibaldi introduced himself, instructed the crowd to shake the rafters with noise, and began painting. He didn't just paint with a brush however, he ran around like a maniac and used his hands, multiple brushes, and a variety of colors. As the painting began to take shape, it appeared to be a man, possibly President Obama. However as soon as Garibaldi painted what appeared to be an earring, it was obvious; we were looking at a portrait of Jason Aldean. Garibaldi finished off his masterpiece with his signature yellow hand print, and turned towards the audience, which screamed with approval and delight. He then began to speak. Garibaldi told his story. As a youngster growing up in Sacramento, California, David loved to paint. He used this energy and his natural born talent in a negative way however, as he began writing graffiti on anything he possibly could, from train cars to buildings. As some of his friends were getting arrested for vandalizing, he realized that he needed to use his talent in a positive way. He had an epiphany that he could use his ability to help others. Garibaldi then designed a presentation that would be extremely cheap, but could also appeal to the masses. Beginning his career painting in clubs and theaters, his program kept on growing. He made it a goal to raise $1 million for charities by the time he turned 30. David changed his attitude in a positive manner. What if he had never made this decision to change his life? Would he be in jail with a record as a vandal? Speaking of changing attitudes, that was the topic of Shannon Norris' retiring address. It's funny how the stars seem to align at all the right times. Shannon gave one of the most heartfelt and moving speeches I have ever heard with a simple, but powerful message. She gave the story of an FFA member that was a budding athlete until she was sidelined by a tumor. Although she was heartbroken about losing the ability to play most contact sports, the things she loved, she changed her attitude and moved on, determined to make something of herself that was even greater than the athlete she yearned to be. Shannon also mentioned a simple equation: Situation + Attitude = Outcome. It means that we cannot typically change what happens to us, but we sure can change the way we adapt to the situation, and create a better outcome for ourselves and those who surround us. Today there were numerous sessions at the National FFA Convention. One of the sessions was completely devoted to awarding young people on their proficiencies at the national level. A proficiency is most often what a student works on over the course of his/her summer and is most often referred to as a Supervised Agricultural Experience (SAE). These SAE’s can range from working for other people to owning a business of one’s own. They also cover nearly all fields of agriculture, from: researching in the veterinary field to working on a pumpkin patch. Tonight many students were awarded for their truly amazing talents! We (everyone else), can only appreciate these people for the work that they are doing at such a young age just to ensure a safe and sustainable future for all of mankind. God Bless! As I walk to Conseco Fieldhouse every day for the spectacular sessions I never took the time to just listen..I just walked and talked and met new people.. But today I did take that time to listen..
What I found surprised me a little bit.. When I listened I saw "national convention" in a whole new way..
First I heard the classic "heyyyyy!!!" that lingers throughout the streets of Indy.. Each state shouting back to one another voicing their friendly hello.. I heard accents from all over the map, Northern voices and southern twangs! That alone made me grin. Then I heard someone yell, "Red robin!! ", almost instantly the crowds around him hollered "Yum!!!"... So many unique people and voices all here harmonizing together. And when I finally did reach the fieldhouse I listened to the the motivating speakers and the inspiring national officers that reminded me the importance of leadership, service, and believing in myself.. While there is lots to see there is so much joyful noise and energy in down town Indy this week.. Everyone around the city knows when the FFA kids come to town and what a celebration it is for youth around this great country. Each night as I lie down in my hotel bed I reflect on the fact that it is such a blessing to be here with so many opportunities around me.. I am continuously inspired by the noise that surrounds me and motivated by each new person I have met! 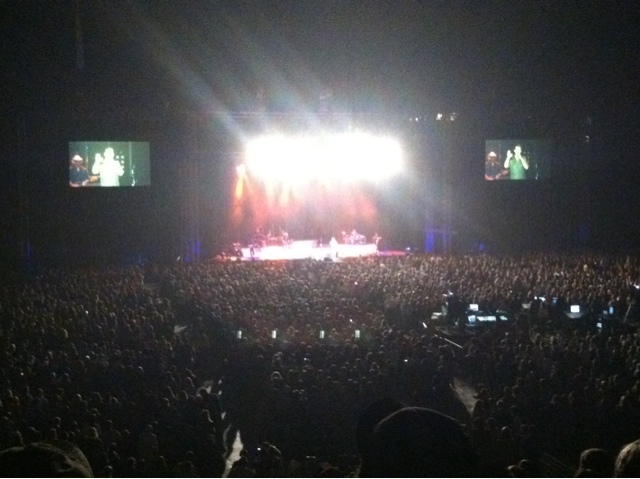 Boots+guitars+country music+thousands of FFA Members = a REAL good time! Here we are.. Standing, dancing, and singing at the top of our lungs to three of the country music world's greatest talents... STEEL MAGNOLIA, LITTLE BIG TOWN, and of course the one and only.. BLAKE SHELTON!!! The mood inside Lucas Oil Stadium is nothing short of the word "electrifying"... Smiles and lots of laughs here we are with thousands of other energetic young people enjoying a night together in this great city.. what a wild, crazy and fun night it is.. And the best part is IT'S JUST GETTING STARTED!! It's that time of year again! Thousands of students from around the country zip up their blue and gold jackets and head out to the center of our great Hoosier state! Indianapolis is literally flooded with the young leaders of tomorrow and as I sit here on the floor of the Conseco Fieldhouse, the stage right in front of me and thousands of people all around me, I realize how blessed we are to be here learning about leadership and growing as people! The energy and passion inside this building is impossible to describe.. And more than once I have had goose bumps on my skin. There is something about National FFA Convention that brings out the passion, enthusiasm and smiles from every young person from around this great land. This week we will BELIEVE in ourselves, others, and this unique organization that has changed so many lives. Until convention officially ends Saturday evening those here in Indianapolis will be on an "FFA high", that great feeling of happiness that we all leave convention with. As the first session wraps up we will continue to celebrate agriculture, youth, and FFA. Here's to an unbelievable rest of the 2011 National FFA Convention..
Every day the delegates representing FFA members/states across the nation have a luncheon. These luncheons begin with a current National Officer welcome, a prayer, and then lunch. Once the meal begins to slow, a speaker is introduced to the stage. Today during the delegate luncheon we were blessed with a presentation from Mr. Jeff Simmons of ELANCO. Mr. Simmons, the President, is doing everything that he can to spread the message of hunger and how we, as agriculturalists, can help. The world population is growing rapidly and we are going to have to do everything that we can in order to help feed the world. Mr. Simmons also spoke about the three rights: food, choice, and sustainment. Hopefully that while over 50,000 members cram into Indianapolis during convention, many are able to gain some amazing inspiration. Agriculture is a diverse field and every single person that attends this convention-5+ 0could easily find a place in their futures under the realm of agriculture. The definition of a flag is “a piece of cloth, varying in size, shape, color, and design, usually attached at one edge to a staff or cord, and used as the symbol of a nation, state, or organization.” I would say this definition is mostly sufficient. With as much as this definition describes, one thing it fails to mention is the emotion that a flag can bring to a location and its citizen. One of the duties of the Indiana Sentinel is to bear the flag throughout National Convention. I am honored to fulfill this duty. With this duty, I am able to participate in the Grand March before the first session and the presentation of the association flags at the Second General Session. Sadly, with the recent weather developments, the Grand March was cancelled. But I was still able to march through the lobby of Conseco Fieldhouse touting the flag of Indiana! Tomorrow afternoon, I will be able to honor the Hoosier State even better. I get to present the flag on stage at the 84th National Convention! How neat is that? Think about it this way, I get to represent one of the 52 areas that the National FFA Organization covers. As the Secretary would say, “wherever corn is grown and FFA members meet.” But maybe even more awesome is the fact that this year, the FFA is focusing on the heritage of Native American tribes. Representatives of ten or so tribes will also display their flags at this year’s convention! My favorite part of the whole process however, is that I get to represent my home, and the place I love; the Crossroads of America that are Indiana. Figure 1. 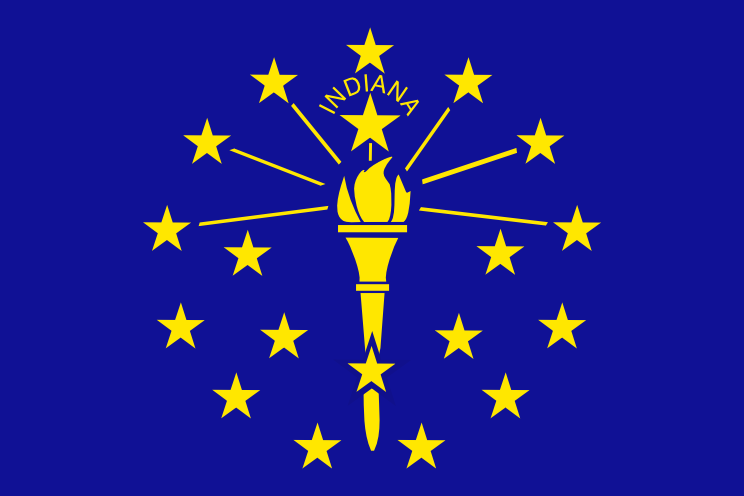 A diagram of the Indiana flag, for those who don't remember what it looks like. We have reached the end of day two of our experience at the 84th National FFA Convention. It was an exciting day as members (not just delegates!) from across the United States started to arrive! It's always neat to see Indianapolis fill up with Blue Jackets. So far, our time in Indianapolis has consisted of delegate work. 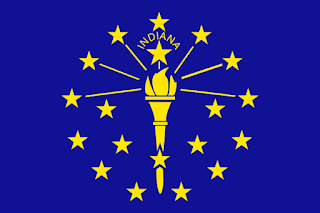 There are 475 total delegates with 8 of them being from Indiana. These delegates consist of the Indiana FFA State Officer team and one member of our Executive Committee. This year, that member is Marshall Perkins. As delegates, we serve on six different committees that were appointed by our National President, Riley Pagett. Each committee focuses on an issue that is facing the National FFA Organization. It is our responsible to come up with suggestions to the National Board of Trustees on how the organization should approach the issues. While we were working on delegate issues, the National Officer Candidates were going through interviews. Today, the National Nominating Committee made their 50% cut of candidates. The 50% of candidates who made the cut will be continuing with interviews and will find out during elections on Saturday whether or not they will be apart of the 2011-2012 National FFA Officer team. We are SO excited for our National Officer Candidate, Morgan Gadd, as she made the top 50%! We cannot wait to see what's in store for her on Saturday. We wish her the best as she continues with interviews! Tomorrow, National Convention will be in full force! I cannot wait to see everybody from Indiana (and of course my home chapter, Warsaw)! Stay tuned for more information on the latest happenings at National Convention! It is National Convention Time! What time is it?! Ladies and Gentleman it is National Convention time! That’s right the time of the year that we have all been waiting for. It is time for over 55,000 FFA members to band together at one huge convention. Let’s get loud and get pumped!! When I think about national convention two things come to my mind. The first is the Sessions. When my chapter comes to National convention we always went to the sessions to hear some of the amazing speakers and of course our retiring National Officers speak. I have always loved listening to the wisdom of both the officers and the guest speakers as they often times provide us, as members, some amazing advice. The second thing that comes to my mind is the career show. The career show will have more than 1,300 booths representing colleges, agriculture-related companies, fundraising companies, U.S. Armed Services, and auto and truck manufacturers. This info comes straight from the National FFA website. I have always enjoyed walking through the career show. It allows me to see what some of my options are for my future. Sometimes when we are in school we can get lost in the shuffle and stop thinking about our futures. Other times we can get so worried about what we are going to do that we just pick something and we don’t consider anything else. Both of those things are exactly why the FFA career show is so awesome. It gives us (as members) the chance to explore ALL of our options!! There is one other part of National Convention that I consider to be legit. That is the National Days of Service. These days of service allow FFA members the chance to learn the importance of serving others. Often times this is a concept that comes very easy, but sometimes it’s important to see how much impact can be made by thousands off FFA member’s hands reaching out to help. I cannot wait until National Convention!! Hope to see you there!! We've been spending the last week and a half traveling throughout the state of Indiana. We started out on the west side of the state last week hitting up districts I, IV, VII, and X. We are now working down the center of the state visiting districts II, V, VIII, and XI. It has been a blast so far! It's interesting seeing how different parts of Indiana can be from each other. For example, when we were in District X, Ross & I had some extra time on our hands so I wanted to look up the closest McDonald's so I can get some Wi-Fi... I was disappointed to find out that the nearest McDonald's was 30 miles away! For somebody who craves the city life, I struggled with that fact. It made me appreciate Warsaw, Indiana a bit more seeing as we have 2 McDonald's - not that I'm a huge McDonald's fan. At all. As we travel, we visit chapters throughout the day and have District Kick-Offs in the evening. I LOVE going to chapters! Our team put together two different visits. One visit focuses on Self-Awareness. During that visit, we focus on identifying with whom we surround ourselves, understanding the impact we have on others, and applying the positive characteristics we see in role models to ourselves. The other visit focuses on Goal Setting. We all set TRAIN goals for ourselves (goals that are Timely, Realistic, Accountable, Important, and Noticeable). We also include activities that explain obstacles with our goals and the importance of setting small goals to achieve larger goals. Yesterday, Jake and I visited Warsaw and Wawasee for chapter visits. It was AMAZING to be back in District II. It was so good to see my chapter and get to know members from Wawasee. During the District II Kick-Off, I was on Cloud 9. The district officers did an awesome job starting out the evening with a dance off (you can never go wrong with quality dance moves) and it just got better from there. It's always important to remember where your roots are. FFA members, always remember the advisor(s), members, and other individuals who helped you get to where you are now.